The cell is the basic building block of an organism and the fundamental unit of life. The idea that all organisms were made up of cells was put together in 1837 by two colleagues – Schleiden and Schwann – who discussed what they had been observing from looking down microscopes in both plant and animal cells. Scientists had been looking down microscopes for hundreds of years at this point, but it was not always clear what they were looking at! Schleiden and Schwann both observed movement within and between cells. They then came up with the cell theory: that all living organisms are made up of cells, that cells are the primary functional unit in every organism, and that every cell has come from another cell. 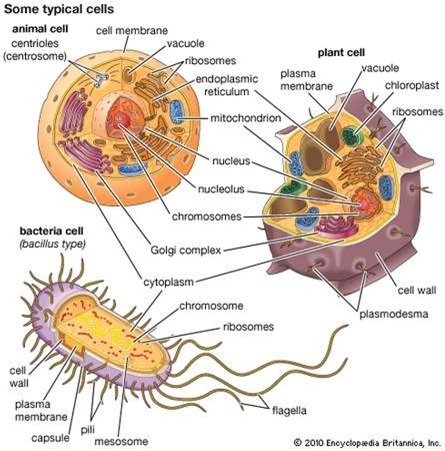 Unicellular organisms consist of only one cell, like bacteria or yeast. More complex organisms such as plants and animals are made up of multiple cells of various types, and are therefore multicellular. Cells often come in various types that have different functions in different organs, tissues and systems. Cells are very small. They are usually between 1-100µm (that’s only 0.001-0.01 cm!) and can only be seen by magnification with a microscope. Light Microscopes use light and magnifying lenses in order to see an object in more detail that the naked eye can. The maximum magnification of light microscopes is usually around ×1500, and their maximum resolution is about 200nm due to the wavelength of light. Another type of light microscopy is fluorescence microscopy. Usually, the structure or molecule of interest is labelled or stained with a fluorescent marker. This can then be analysed under a fluorescent microscope, in which light of a certain wavelength is used to excite the fluorescent molecule, which then omits light of a different wavelength. This means regions of interest can be specifically highlighted for close examination. More advanced microscopes exist to visualise even smaller structures, including super-resolution microscopes which use specialised technology to overcome the limits of the wavelength of light (giving a resolution of approximately 40nm), and electron microscopes, which use electrons (with a much smaller wavelength than visible light) to create an image with resolution as great as 0.1nm. At the most basic level, organisms can be divided into two classes, depending on the fundamental nature of their cells. These classes are prokaryotes and eukaryotes. Prokaryotes contain two groups: bacteria and archaea. They are always unicellular, and contain no membrane-bound structures that are found in eukaryotes. On the other hand, eukaryotes consist of plants, fungi and animals. They differ from prokaryotes because they are much more complicated. They contain complex substructures that are specialised for different functions, called organelles, which work in concert to allow the cell to carry out its purpose. 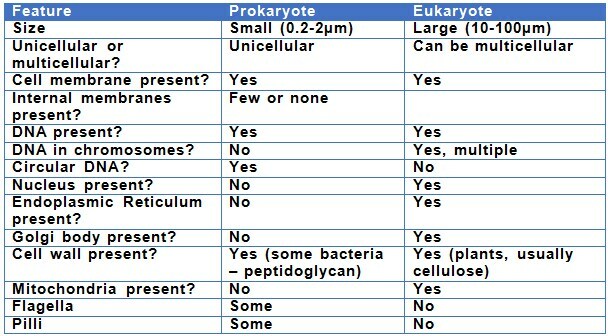 There are some key elements that a cell usually needs in order to function, regardless of whether it is a prokaryote or a eukaryote. This includes the genetic material (DNA), which is often referred to as the “instruction manual” for the cell. All cells also have a plasma membrane, which is the outer layer of the cell that protects the inner contents from the outer environment. Additionally, the cytoplasm, which consists of all of the material inside the cell (excluding the highly specialised substructures called the nucleus in eukaryotes), and ribosomes, which are another important organelle that synthesise proteins based on the information contained within DNA. Prokaryotes are much simpler than eukaryotes, and lack membrane-bound organelles. One of the most specialised membrane-bound organelles that exists in eukaryotes is the nucleus, where DNA is stored. Prokaryotes do not possess a nucleus, and therefore the genetic material is not encased in a specialised substructure, but is instead found in a cytoplasmic region called the nucleoid. The DNA is also a much more simple structure than it often is in eukaryotes. In eukaryotes, the DNA is organised into complex, protein-rich structures called chromosomes. However, in in prokaryotes, the DNA is not bound to any proteins, and forms circular structures called plasmids. Prokaryotic cells also typically have a cell wall made out of peptidoglycan, a polymer composed of sugar and amino acids that forms a protective mesh on the other layer of the cell. This helps the cell protect its shape and regulate its water content. Some bacteria also have an additional layer of carbohydrates called the capsule. The capsule protects the cell from being engulfed by eukaryotic cells, such as the cells of the immune system. Some bacteria also possess flagella, which are outer whip-like structures that act as sensors and help the bacteria to move. They may also have hair-like structures known as pili, which are required for the exchange of information between cells. Eukaryotic cells have a variety of different compartments with specialized functions. These structures are separated by their own membranes, meaning they can regulate their own internal environment to diversify their functions. Some key features of a eukaryotic cell include the presence of a nucleus, the important structure that holds the genetic material. The genetic material is also stored differently, it is packaged into multiple chromosomes, rather than in a circular molecule. There are also several additional membrane bound organelles (such as mitochondria, chloroplasts, Golgi bodies, vacuoles and an endoplasmic reticuli).